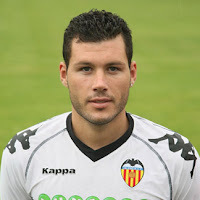 Valencia CF: Valencia transfer plans? Superdeporte has reported Valencia's transfer plans? Personally I''l take this with a lot of salt and I certainly don't think Valencia staff have given them transfer plans, knowing that Llorente stopped 2 transfer negotiations because of leaks. Anyways reportedly Valencia's whole back line will change for next season. David Navarro will go, Miguel Brito and Bruno will also go and apart from Adil Rami Valencia is suposedly searching for another central defender to partner Rami, so Dalebert and/or Stankevicious will go as well. Basically only Ricardo Costa is safe and on the left back position if they manage to keep Mathieu they will not buy anyone, but if a good offer comes along and no deal has been reached with the player they will sell him and then purchase another left back. It is said that the midfield will also change with Vicente Rodriguez definitely ending his career with Valencia, Maduro contract will be extended, Ever Banega and Pablo may also leave if big offers come along, basically only Albelda is certain to stay and extend his contract by one year and even Joaquin may be sold as his current salary is too big and if they can't reduce his salary, VCF staff are going to listen to offers for Joaquin. The likes of Chori Dominguez Nacho Gonzales are certain to be sold. The attack will reportedly be unchanged with the trio of Soldado, Aduriz and Jonas performing within expectations and last but not least there would be 3 goalkeepers next season with Guaita, Diego Alves and either Moya, Cezar or Renan. Again I'd take this with a lot of salt as its quite hard to find two new right backs and just sell the current ones, I mean what happens if the new purchases turn out flops, you end up with no cover for the position. So one right back is certainly going to come, but not two. As far as the midfield goes I think Chori, Nacho and Fernandes are certainly going to be sold, Feghuoli possibly loaned out again, but other than that I think everyone else will stay.